If you are short of time, the answers to the following 3 questions should let you know all you need to about the ProtectiveClean 4100. If I have missed something, let me know in the comments. If you want more detail, you can read the full Sonicare ProtectiveClean 4100 review further down the page. Definitely not — we rate this as the best overall choice in our electric toothbrush ratings. It is a decent electric toothbrush, that looks good, feels good in the hand and importantly cleans well. It comes with all the essential features I would expect of a decent electric toothbrush including a timer and pacer; but useful extras like automatic power off and an alert system to remind you to change your brush head. Alternative brushes to consider are the Sonicare ProtectiveClean 6100 and the Oral-B Pro 1000. The 6100 is a more feature rich version of the 4100 and benefits from additional cleaning modes, brushing intensity settings and a travel case — we compare the ProtectiveClean range in our Sonicare 4100 vs 5100 vs 6100 post. The Pro 1000’s main differentiator is Oral-B’s oscillating/rotating cleaning action. It lacks the pressure sensor and has only 7 days battery life, but it is cheaper. 3. Where’s the best place to buy the 4100 ProtectiveClean? Philips Sonicare have a good reputation in the oral healthcare space and over the years have made some excellent electric toothbrushes. The ProtectiveClean series includes the 4100 being reviewed here, as well as the more feature rich 5100 and 6100. Whilst the 4100, could be considered the more entry level brush, it focuses on the core requirement of an electric toothbrush and it does that job well. There are different models within the ProtectiveClean series from Sonicare, but the 4100 on review here actually comes in a few different versions. Each model offers the same cleaning mode, battery life and performance, it is just the handle color provided in the box that differs. Listed below are the different variants of the Sonicare ProtectiveClean 4100. Not all retailers stock each variant. So, if you have a particular one you want, then you may have to shop around to find it; best to go to Sonicare’s website, and see who is stocking that variant. In this hands on review I have been testing the HX6810/50. Here are what I believe to be the advantages and disadvantages to this electric toothbrush. Design – Smart and comfortable to hold in hand with different color options available. Brush head price – Some variance in the brush head price, can be quite expensive. Box contents – Would be nice to get a travel case or an extra brush head in the box. Out of the box and in hand the ProtectiveClean 4100 is a lovely solid and premium feeling electric toothbrush. If you have handled or used any other Sonicare product before you will know what I mean, when I say it has the ‘Sonicare’ feel. I must give a quick thumbs up to Sonicare here for their packaging. Whilst I am sure, the box could be made smaller, it is made of cardboard as is the inner tray that holds the brush, charger and brush head. It would be nice if these were not wrapped in the plastic bags like they are, but at least cardboard is recyclable, unlike the polystyrene packaging Oral-B uses. The 4100 is available in 2 different color options. There is the Black and White that you see in the hands on images as well as a White and Mint. On the Black and White color option that I have been testing, the majority of the handle is Black, whilst the panel around the power button is White. The brush head supplied is White in color too. With the White and Mint, the handle is all White, with the panel around the power button being Mint. Personal opinion, but I would have quite liked it if the brush head with the Black colored model was Black too. Sonicare do make them. If you are a bit picky like me, you can always buy the Black colored brush heads. To be fair the Black and White color combo works. Naturally, the White handle comes with a White brush head. A neat touch is that the charging stand with this Black model was Black too. Most of the time the charging stand is White. If the handle and the stand is Black tough, why not the brush head?! Sitting roughly a third of the way down the handle is the round power button. The concave button is relatively easy to press with a bit of feedback. Surrounding the power button is the color accented panel. The remainder of the front is smooth to the touch and free of any icons until you you get almost to the bottom. First sits the BrushSync LED and symbol below it and the battery LED and symbol below that. At the top of the brush handle is the metal shaft that the brush head connect to. This metal shaft feeds into the motor sealed inside the handle. You might notice, there is no icon or LED for the cleaning mode on this brush. This is because the brush offers just 1 cleaning mode, so really there is no need. If you want to know more about other cleaning modes Sonicare offers on different brushes, see this post. You simply press the power button once to turn the brush on. Press and hold it for a couple of seconds, if you want to turn the brush off, before the cleaning time has elapsed. As the power button is pressed, it activates the built in timer. This timer runs for 2 minutes, which is the dentist recommended cleaning time. At the end of the 2 minutes, the brush actually turns itself off. This is not something all brushes do, but it is a feature that I like very much. Not only does it make it clear that the 2 minutes is up, but it helps save battery power too. Should you want to brush for longer, you will need to power the brush back on. The 2 minute timer is very useful, but what takes the timer to the next level is the pacer that is also built in. If you are not familiar with the quadpacing setup built into the 4100, allow me to explain. Whilst dentists recommend 2 minutes of cleaning twice a day, what this does not help with is ensuring you and I brush our teeth evenly. This is where the pacer comes in. The pacer acts as an alert to you, to change quadrant as you brush to ensure this even clean. Of course you don’t have to follow it, but it is good practice. Spending 2 minutes cleaning just the front teeth or just your top teeth is better than nothing, but isn’t great for your oral health. Therefore the 2 minute timer and 30 second pacer are 2 excellent additions to this handle and what I consider core features of an electric toothbrush. Be aware too, that there is a particular technique with cleaning the teeth. The brush head should be held at a 45 degree angle to the teeth. Refer to the documentation Sonicare include in the box to find out more. Clean mode is the name given to the only cleaning mode available on this brush. It makes use of the full power of the motor that is built into the brush handle. Offering 62,000 movements per minute, the bristles of the brush head move rapidly over the surface of the teeth and gums to dislodge bacteria, plaque and food debris. Whilst some might wish for additional modes, perhaps a more gentle sensitive or gum care mode, there is something quite appealing about the simplicity of just 1 mode that works for most users. The 4100 comes with the C2 Optimal Plaque Control brush head supplied. This is are just 1 style from a range available from Sonicare. Deep in between teeth cleaning, removing upo to 7x more plaque. Idea for those with increased periodontal disease. Up to 7x more plaque removal. Ideal for excessive plaque and tartar build-up on tooth surface. Helps improve gum health with 6x more plaque removal. Ideal for excessive plaque and tartar build-up at the gumline. Helps whiten teeth in just 1 week and maintain the white teeth achieved after cosmetic whitening procedures. Capable of 7 times more plaque removal than a manual toothbrush. Deepest clean with flexible sides and unique bristle pattern. 4 times more surface contact. Absorbs excess cleaning pressure to protect the gums. 2 times more surface contact. Helps whiten teeth in just 3 days by removing plaque and surface stains. 4 times more surface contact. It is these premium brush heads that offer another of the ProteciveClean’s clever features. The 4100 has something called ‘BrushSync’. Despite the name of this feature perhaps being a bit vague, what it actually does is really quite clever, it reminds you when to replace your brush head. The handle knows that the brush head should be replaced every 3 months, so once the handle detects that the brush head has been used for this amount of time, the ‘BrushSync’ LED on the brush handle will light up an Amber/Orange color to tell you it is time to change the brush head. Our own research found that 30% of people don’t change their brush heads every 3 months. Using a brush head for longer than 3 months can potentially have negative effects on the teeth and gums, so such an alert helps reduce the chances of this. This is a very neat touch and shows how technology can be used in a positive way to better the nations oral health. All pretty impressive stuff hey?! When you do replace the head, the process is simple. Each brush head simply pushes on and pulls off of the brush handle. These smarter brush heads do (at the time of review) come with a price premium over the standard (microchip free) heads people are more familiar with. Prices vary from one store to another. I have found them as low as $8 per head, but as high as $15. An average price is around $12, which is admittedly $3 less than when these were first introduced in 2017. In a couple of years, I expect the price will have dropped even further. A normal brush head for a Sonicare electric toothbrush is on average $8. So the takeaway here is to shop smart when it comes to the heads you want to use on your ProtectiveClean 4100. We cover brush heads in more detail in our guide to sonicare brush heads. It is perfectly possible to use a non-smart brush head on the 4100 as it is perfectly fine to use a smart brush head on a handle that does not offer BrushSync technology. But, do be aware, the BrushSync will only work when a compatible head is used on a compatible handle. It is worth noting that although the ProtectiveClean 4100 offers the alert to change the brush head, all of the heads Sonicare produce have fading indicator bristles. These essentially act as a reminder to you like the BrushSync does. As the heads are used, the Blue bristles fade to a very pale almost White/Translucent color. When they are this color, it is time to change the head. You can be assured that Sonicare heads are make to a high standard, and each bristle is rounded at the tip to avoid doing any damage to the teeth and gums. Bristles need only skim the surface of the teeth. Lots of force is not required to brush the teeth clean. Brushing too hard over long periods of time can wear out brush heads but also cause gum recession and damage to the tooth enamel. This then is why the 4100 has a pressure sensor built in. The BrushSync replacement reminder LED flashes Amber when the sensor is activated. Given its position, it is not the easiest to see. It does not have the large visible pressure sensor like the the Oral-B Pro 1500 and 3000 and Sonicare’s own DiamondClean Smart. Personally I do think the light it more obvious, particularly when most of us tend to brush in front of a mirror. Sadly, the flashing Amber light is on the wrong side of the handle for you to really notice, but you should feel the change in brushing sensation. However, the vibration is strong enough to make you aware it has been activated. To stop the pressure sensor, just relieve the pressure applied to the teeth. If you are not used to the power of an electric toothbrush, the full 62,000 movements per minute (31,000 brush strokes) can seem quite intense on first use. EasyStart eases you in. If you desire, it is possible to turn off EasyStart as well as the pressure sensor and the brush head replacement reminder. Directions on how to do this are included in the FAQ’s towards the end of this review. The clean provided by the 4100 is excellent. After every use, my mouth felt refreshed. I can’t really fault it. The smaller round brush heads found on Oral-B models can be a little easier to move to the back teeth in particular, the Sonicare heads are a little larger. Those with smaller mouths and cramped teeth might find Oral-B’s brushes to be better suited to them. Inside the handle, is the rechargeable Lithium-Ion battery that offers 2 weeks usage between charges or so Sonicare claim. I actually managed 5 weeks! When the power is low, the brush will indicate this through the battery indicator LED. Just pop it on the provided charging stand for up to 24 hours to fully recharge. Designed to resist water, toothpaste and saliva, the handle of the 4100 is not designed to be used in the shower or the bath. A quick rinse of the handle is fine, but don’t go immersing it in water. Sonicare do offer a 2 year warranty that covers any mechanical or workmanship faults, but not user damage. For your own benefit, go register it shortly after purchase and get an extra 6 months for free. Whilst 1 brush head and a charging stand is all you need to get you up and running, it would be nice if there was a little extra box contents, maybe another brush head or a travel case. Perhaps I am being a bit picky given the price, but it would have been a nice touch. If you want a travel case, which is admittedly handy for regular travellers, you will need to buy one separately or chose a model like the Sonicare ProtectiveClean 6100 that comes with one in the box. The 6100 does provide more cleaning modes for those who desire it. Seeing as many of us end up sticking with the default mode, there little need upgrading to this model unless you feel you would benefit from alternative cleaning modes. Those with particularly sensitive teeth, who like a less powerful and softer brushing experience might be tempted by the 6100, even if it costs more. Oral-B’s Pro 1500 is very similarly featured and priced to the 4100, but comes with a Sensitive cleaning mode, so this is an option too. Having used the ProtectiveClean 4100 for a few weeks and compared it to many other models I have used, I have to say I am really hard pushed to find fault. It cleans the teeth well, has all the core features of an electric toothbrush, plus a few more for added benefit. Sonicare have made a fantastic toothbrush. The importance that you place on battery life may well be different to me. For a large number of us, we brush our teeth at home when we are near to a power source, so we don’t need to worry about how long the battery really lasts, because it is so easy to recharge it. However, there are still a good few people who travel regularly and want to do so with as little luggage as possible. So, if you are off on a 10 day trip to see relatives in another state, it would be great if you could leave the charger at home. The Sonicare 4100 offers 14 days of battery life or so Sonicare claim. This would be acceptable, but my hands on testing managed 5 weeks, 2.5 times what Sonicare suggested. I can’t guarantee you will get quite the same performance and I am surprised I achieved as long as I did, but wow! Safe to say 2 weeks is the absolute minimum! The White colored stand allows the brush to sit on top of it. A prong on the stand fits into the recess on the base of the brush handle. It can take up to 24 hours to charge the handle fully. A US power adapter is wired into the charging stand, but it does support 100-240v. What this means is that you can actually travel to other countries, like those in Europe and use this charging stand. You will require a plug adapter only and not a voltage adapter. Towards the bottom of the brush handle, on the front is a battery/charging icon. The way in which it flashes and the color it is lit tells you how much power is in the Lithium battery. It would be nice if the indicator was a bit more accurate, like a smartphone battery that gives you a percentage (%), it can feel a bit vague at times, but no brush offers such. Once placed on the charging stand, the charger will emit 2 short beeps to confirm that the handle is placed properly. But, good practice is to let it run down a little and not constantly be fully charged. To avoid doing any potentially long term damage to the battery, keep it unplugged unless it needs charging. The Lithium-Ion (Li-Ion) cell sealed inside the handle is not user removable. It is more efficient and reliable than the Nickel Metal Hydride (NiMH) cells that have been used in many toothbrushes in the past. A small but significant feature built into the brush which allows this usage time, is the automatic power off. At the end of a cleaning cycle, the brush turns itself off to signal the end of the clean and conserve power. Oral-B models do not do this. Given that the Sonicare 4100 does not have the most features of an electric toothbrush today, nor does it have lots of items in the box, this brush is far from the most expensive available. The suggested sale price is $69.99. When you compare to other models available, this is pretty much on par, particularly when most actually sell a little under the suggested sale price. At the time of review, just a few weeks after the 4100 launched, the actual price you can buy the brush for is around $50, so a $20 saving. In fact 4 major retailers were priced within just $5 of each other. We have listed a few buying options at the start of this article. This makes the 4100 very competitively priced. As you probably expect, prices are always subject to change and some retailers adjust their prices and run offers more frequently than others. Prior to the 4100 being launched, the Sonicare 2 Series and Oral-B Pro 1000 were the best example of a great electric toothbrush for the money. Typically these 2 brushes sell between $40-50. These 2 brushes are still available at the time of writing, but I suspect the 2 Series will be phased out. At around $50, given the brush is newer and offers neat features like the brush head reminder system, it is a great value buy. Naturally, brush heads require replacement. Advice is to replace each head every 3 months. Of course the 4100 will remind you to do this. The technology required for this reminder system has impacted the cost of the brush heads. You need to be a savvy shopper here. It is possible to save quite a bit of money on the heads if you can. In time, the cost will come down further I am sure. In fact, there has already been a few dollars knocked off the average price since these heads were first introduced in 2017 with the DiamondClean Smart. You could opt for the official Sonicare brush heads that are not ‘BrushSync’ compatible, but that kind of defeats the point. There is the initial purchase price of approximately $50 for the brush. Add in the cost of replacement brush heads at approximately $12 each and there is an additional cost of $132 over 3 years. The total cost therefore comes to $182 or $0.17 per day. If you are able to pick up a deal on the brush heads at the lower cost of $8 per head, the cost reduces quite significantly. It would then total $138 or $0.13 per day. For the sake of comparison, the lesser featured Oral-B Pro 1500 works out at 7 cents per day, primarily because its brush heads are around $5 each. You might consider the more premium Sonicare ProtectiveClean 6100 but that comes in at 18 cents per day. Considering the features, the performance, the box contents and the comparable brushes, although a touch more expensive than the Oral-B option, I think it still represents great value. My hands on testing does not put the ProtectiveClean through specialist machines that stress test it and expose it to all the elements to find out how and when it will fail. I use it just like you would, at home and on my travels. Having handled so many different toothbrushes and having received feedback from readers and other electric toothbrush users, I can often pick up potential faults and build issues that exist. Sonicare have always had a high standard and the 4100 does not disappoint here. It feels solid and well built in hand and the construction is spot on. Naturally being an electric item things can go wrong, but the chances are slim. Should it fail,, the brush comes with a 2 year warranty that can be used to get it repaired or replaced (at Sonicares discretion). Register it online after purchase and get an extra 6 months extension to that warranty, for free. I truly believe you can buy this brush in confidence that it will serve you well for many years. Just go and buy the ProtectiveClean 4100, this electric toothbrush is practically faultless. If you want an electric toothbrush that delivers an excellent clean, has an excellent battery life, is reliable and not bogged down in unnecessary features, then this is it. In an ideal world, an extra brush head or a travel case in the box, but I am perhaps being a bit greedy considering the price. Is the ProtectiveClean 4100 an oscillating brush? How many cleaning modes does the ProtectiveClean 4100 have? The 4100 has just 1 cleaning mode known as ‘Clean Mode’, it lasts for 2 minutes. The brush head supplied with the 4100, depends on the exact variant that you purchase. It will come either with 1 x C3 Optimal Plaque Control or 1 x G3 Optimal Gum Care brush head. Does the ProtectiveClean 4100 have a pressure sensor? Does the ProtectiveClean 4100 have Bluetooth? Does the 4100 come with a warranty & how long is it? Does the ProtectiveClean 41000 have a built in timer? Sonicare claim 2 weeks, but I achieved 5. The ProtectiveClean 4100’s charging station or brush head holder has not been designed to be fixed to a wall. Can I use the ProtectiveClean 4100 in the shower? No. A travel case is not provided in the box. Do you own or have you used the Sonicare ProtectiveClean 4100 Series? I have a question regarding some of Sonicare’s newer brushes, as I’ve heard their DiamondClean series of brushes leave you with that “dentist-clean” feel from many reviews. However, I’ve also seen that the brushes break within 1-2 years due to a bad battery, and people are getting multiple toothbrushes within 4-5 years. Is the better clean really worth the investment? Or should I look at the ProtectiveClean? And could a ProtectiveClean with an alternate brush head fill in the shoes of the DiamondClean? Thanks for the question, it is a good one. That ‘dentist-clean’ feeling is something I do believe you can get from any of the Sonicare brushes. 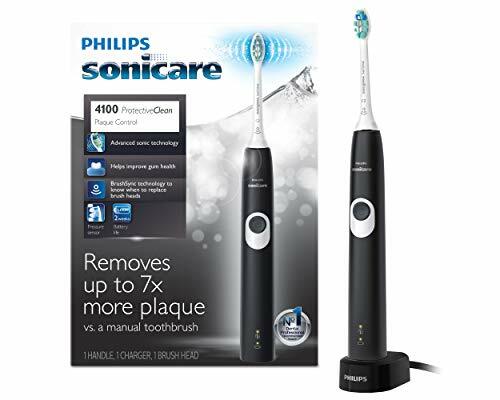 As far as I am aware, this claim is made as part of the Philips Sonicare marketing, because the power and efficacy with which their brushes clean is considerably better than the manual brushing experience many people are familiar with. Therefore if you use for the first time it feels as good as going to the dentist. Their brushes do clean well, but all models (as far as I am aware) have the same motor that offers 31,000 brush strokes/62,000 movements per minute. Therefore the cleaning capability of the DiamondClean vs the ProtectiveClean model is no different. The DiamondClean range do have extra cleaning/brushing modes, but we have been unable to get the information from Sonicare as to just how each of those modes differ. But, the reality is that for most people those additional cleaning modes are not necessary and do not make any significant difference in the user experience. The provided brush heads with the ProtectiveClean range are more than good enough and you don’t need to necessarily use the same that comes with the DiamondClean. Provided in the box with the DiamondClean are some premium features like a travel case that allows you to charge the brush in the case, which is a nice to have, but in most instances not a requirement. There are reports of the DiamondClean brush failing within 1-2 years, but I think many of these failure points have been addressed and you do have the warranty available should something go wrong. The ProtectiveClean brushes are a newer range, so hopefully are more reliable, but they have only been available for a few months so really confirming this is difficult. Therefore overall, unless you partiularly desire the additional cleaning modes, travel case or design of the DiamondClean range I would suggest the ProtectiveClean, in particular this 4100 is more than good enough for your day to day needs. I hope this answers your question. Should you have any others, do let me know. In your opinion, which is better, Oral-B pro 1500 or Philips Sonicare 4100? I received both for Christmas and need to decide which one to return. I have never used an electric toothbrush. Thank you so much! Well lucky you, 2 electric toothbrushes. To be fair both are very good and it is a tough decision. However, the 4100 takes the edge for us just, so I say stick with this. I originally had the Oral B. It always needed recharging. When I called the manufacturer, they were of no help. Agreed it may have a problem, but would not pay for me to return it to them. I now have the Sonicare 4100 and am very satisfied with it. For the above reason, I would never buy the Oral B again. Does Sonicare make a sensitive brush head for the protective clean 4100, and if so what is the number for the brush head? If they don’t make that type of brush head, what is the best brush head and what is the number to order it? Philips Sonicare make a whole range of brush heads. A full explanation of their can be found here. There is a ‘Sensitive’ brush head, but this does not have the BrushSync technology built in, which is a feature of the ProtectiveClean 4100. Therefore to enjoy this benefit, the best head to go for is the Philips Sonicare G3 Premium Gum Care head available here on Amazon.